Picaditas or sopes? Actually both the same recipe, but depending on the region of Mexico you are enjoying these tasty antojitos! These picaditas are tasty as an appetizer or starter for dinner. I will often prepare the corn masa cakes ahead of time and then just take out a few at a time. The salsa recipes are a must try at least once! Cooking with pork lard is not for everyone and I totally respect that. Look for the natural rendered pork manteca anywhere authentic Mexican groceries are sold. It should be beige or a little darker in color, not white. Skies the limit on what you can top these tasty picaditas with! But on today's recipe, I wanted to show you the simplicity of a traditional red and green salsa. Just wait until you find out what the secret ingredient is in both salsa recipes! In a bowl, add the warm water and salt. Stir to dissolve salt. Gradually add in the masa harina until dough forms. If it feels too sticky, add 1 more tablespoon of masa harina. Divide into 8 equal pieces, roll into a ball. Transfer to a plate, cover and set aside. While the masa is resting prepare your salsa's and prep your toppings and garnishes. See salsa recipe below. When ready, preheat the comal to medium heat for a few minutes. Using a tortilla press lined with plastic, press the masa balls to resemble a small thick corn tortilla. Cook for 30 seconds per side on preheated comal and transfer to a tortilla warmer as you cook them. To finish, take each thick tortilla and pinch all around the center to create nooks and crannies. It should almost resemble an English muffin, lol! A Mexican version! Place on preheated comal. Drizzle onto each picadita about 1 tablespoon of melted pork manteca. Cook until the picadita becomes a little crisp, turn as needed. Top each one with red or green salsa, finely chopped onion, queso fresco and more salsa! Buen Provecho! 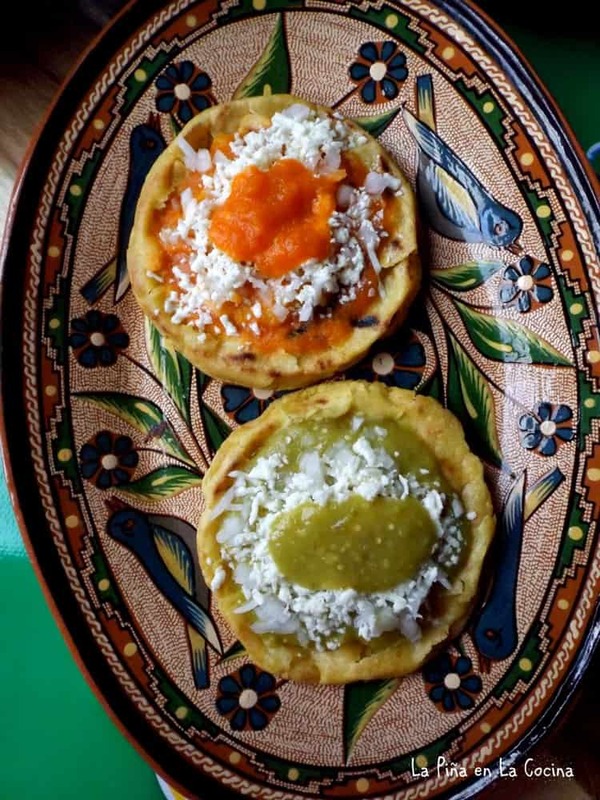 Picaditas are flattened in a tortilla press to resemble a thicker corn tortilla. After you cook for 30 seconds per side on a preheated comal, pinch all around the center and then pinch up the sides a little. The nooks and crannies you are creating will help the manteca go through out and make is more flavorful and crispy in some spots. In one pot add tomatillos, 1/4 onion, garlic and serranos. Cover with water and bring to a boil. Reduce heat and simmer for 8-10 minutes or until tomatillos turn color. You don’t want them to tear open. Remove from heat. Using a slotted spoon transfer your salsa ingredients to the blender. Add 1/2 cup of the cooking water and bouillon. Cover and blend on high until very smooth. Taste for salt. In a pot, preheat the 1 tablespoon of pork manteca at medium for 1-2 minutes. Carefully pour in the salsa from the blender. Reduce heat and simmer for 12-15 minutes. For the red salsa, you will do the same as the green. The only difference is that I removed the core from tomatoes and peeled the lose skins off after I cooked them. This fried salsa will only be good for a few days stored in the refrigerator. The only way to preserve it is to freeze it. These dinner picaditas were topped with beans, beef barbacoa, guacamole, cotija cheese, crema, sliced onion and cilantro. Link for Beef Cheek Barbacoa right here! This loaded Picadita I developed a few years ago for the Hispanic Kitchen site. Topped with beans, pork in adobo, guacamole and salsa cruda.